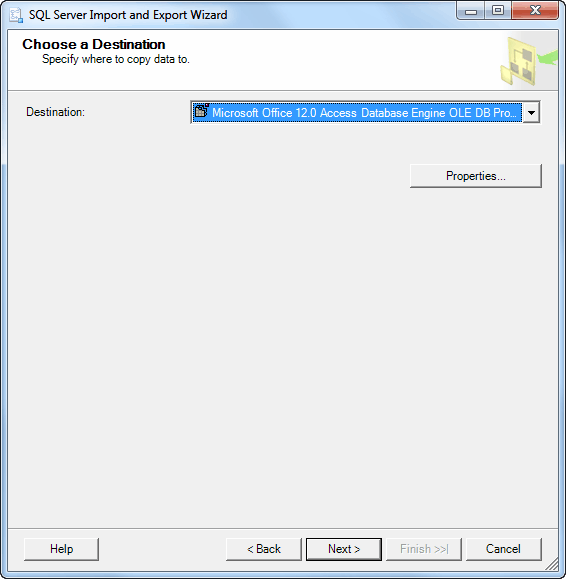 This article contains a complete example of SQL Server data export to Microsoft Excel and CSV files using SQL Server Integration Services. You will find a useful configurable command file to run export packages. SQL Server Integration Services (SSIS) are powerful tools to import-export data between SQL Server/SQL Azure and other data sources including Microsoft Excel 2003-2016 and CSV files. 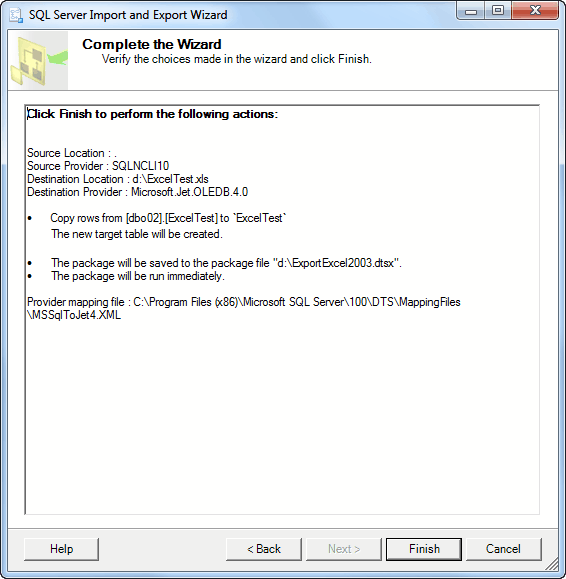 SQL Server Import-Export Wizard when you create packages. So, if you have Microsoft Office x64 installed, you should install the 64-bit provider and use the 64-bit Import-Export Wizard. To configure the provider, fill in the Data Source value with an Excel workbook path and Extended Properties with the "Excel 12.0;HDR=YES" value for import to SQL Server from Excel, and the "Excel 12.0" value for export from SQL Server to Excel. The Flat File Source Provider is available by default and has 32-bit and 64-bit versions. 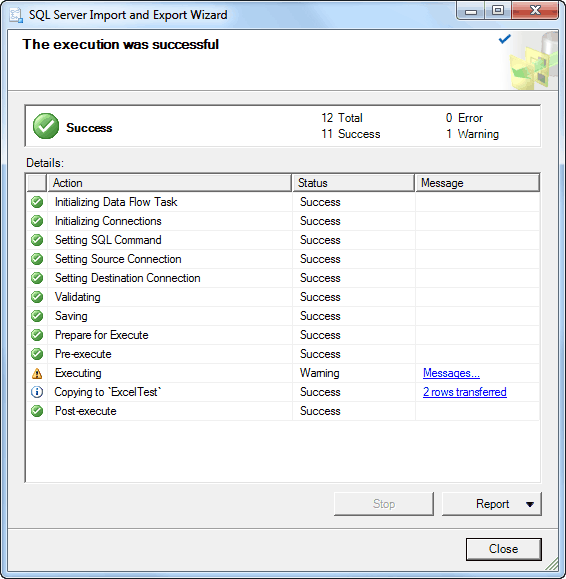 Description: Microsoft.SqlServer.Dts.Runtime.DtsCouldNotCreateManagedConnectionException: Could not create a managed connection manager. Moreover, I cannot find a solution. 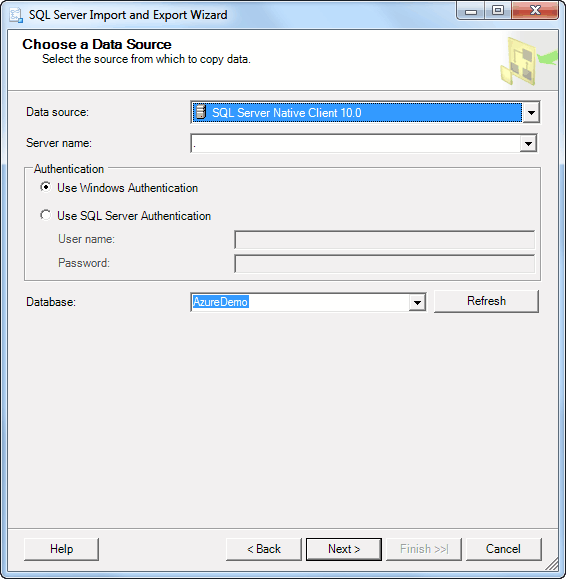 So SQL Server Native Client is the best choice. 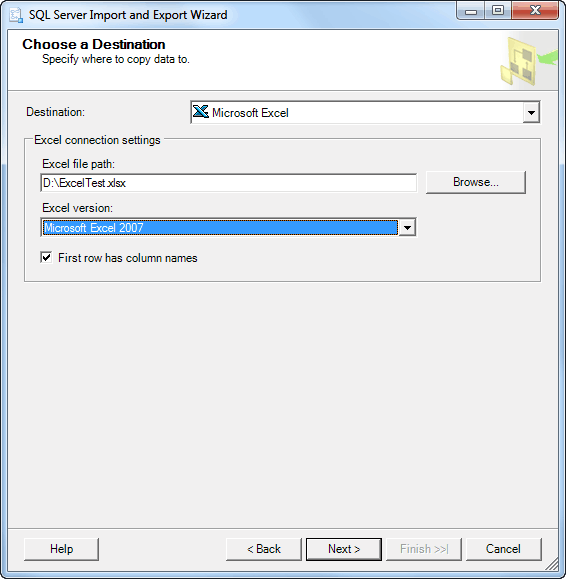 You can choose the Microsoft Excel provider and select Excel 2003 or Excel 2007-2016 version only if you run the 32-bit version of the Import-Export wizard. You should run the 64-bit version of the Import-Export Wizard to export to Excel 2007-2016 if you have the 64-bit Microsoft Office installed. In the 64-bit version of the wizard only manual configuration of the ACE OLE DB provider available. Fill-in Data Source and Extended Properties fields as shown below. Pay attention that the "Excel 12.0" string is used but not "Excel 12.0;HDR=YES". It is a good idea to test connection. 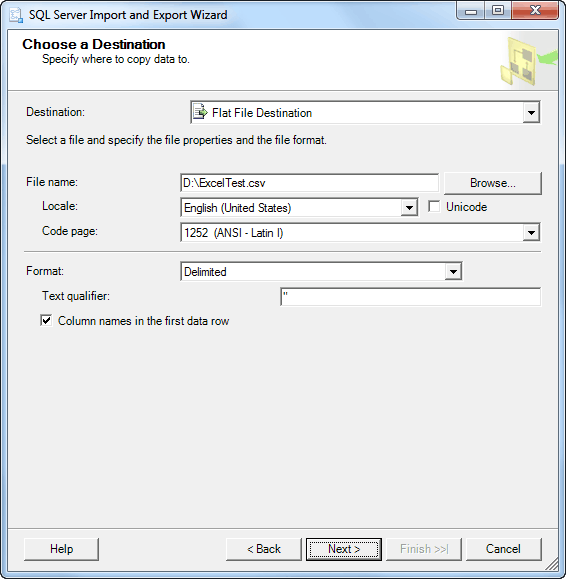 Select the first option to export data from a table or view. 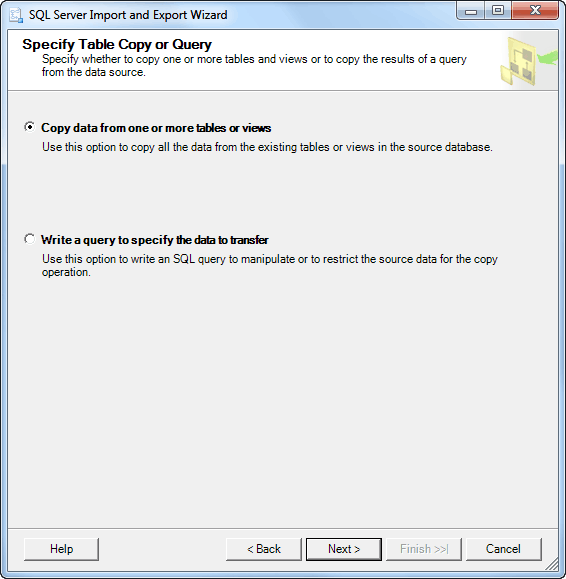 Select the second option to export data from a query or stored procedure. If a destination file still not exists, you may choose a new table as a destination. 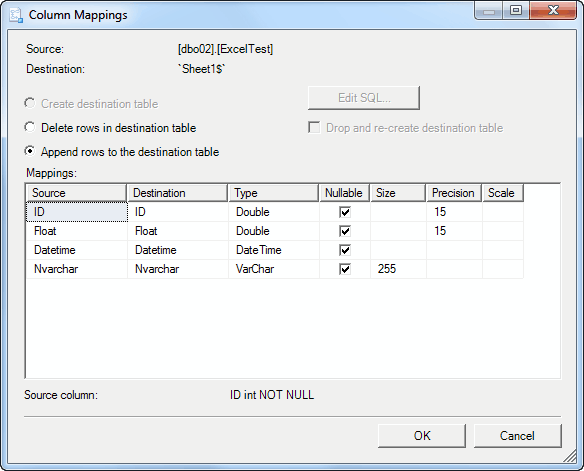 In the Columns Mappings dialog box, you can see the Create destination table option. 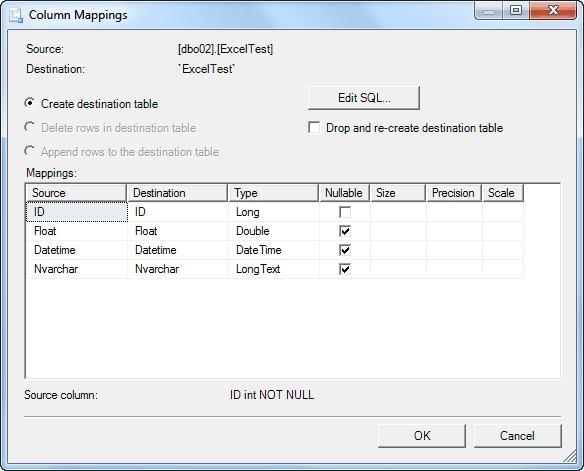 The Drop and re-create destination table option does not work with Excel files. 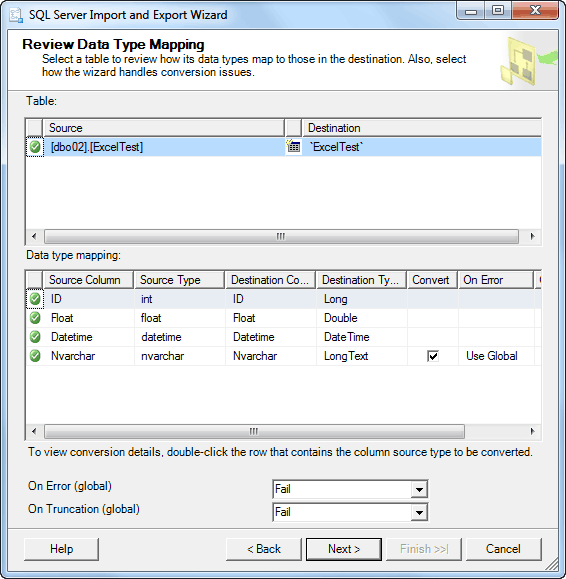 The Create destination table mode works only with Excel 2003 and does not work with Excel 2007-2016. Also, you should delete the existing destination file before the package run. For Excel 2007-2016, you should use an existing workbook as a destination file. For Excel 2003 you can. Also, you should create column names on the destination worksheet and fill in one row of test data at least. 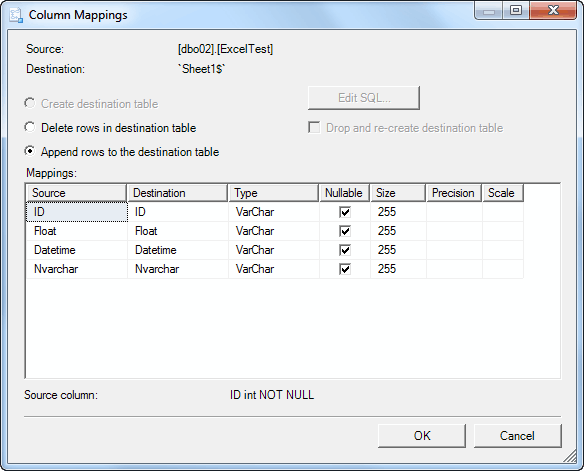 If the destination worksheet does not contain test data, you get all types as VarChar. 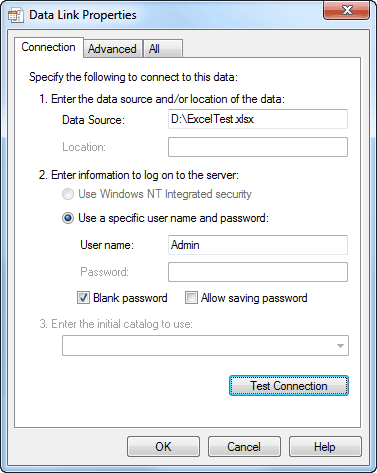 To avoid this issue provide test data before the Import-Export Wizard run. The types are quite different for non-existing and existing files, but the both work fine. 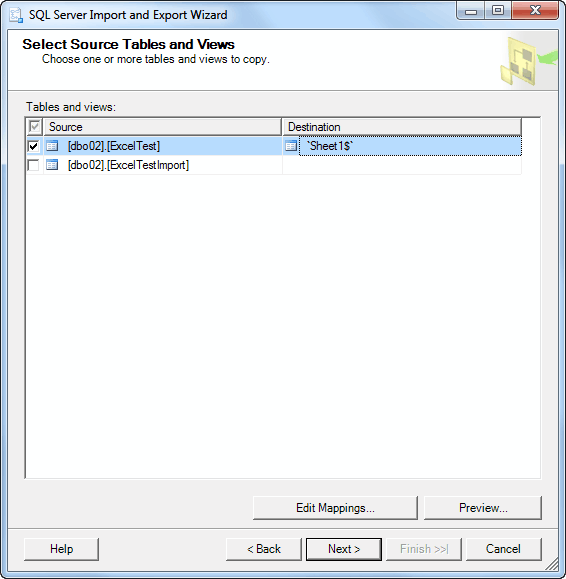 SQL Server Export to SCV can be used as an alternative of exporting to Excel files. The Wizard steps are quite similar to steps discussed above. 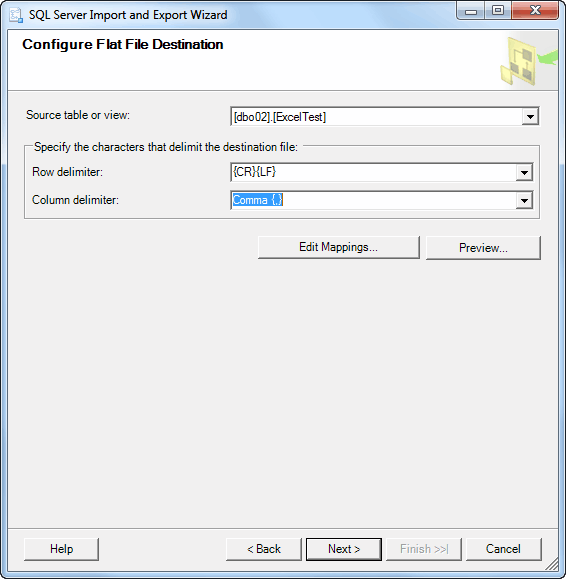 On the Choose a destination step you should select the Flat File provider. Pay attention to Text qualifier field. This result is not good too. 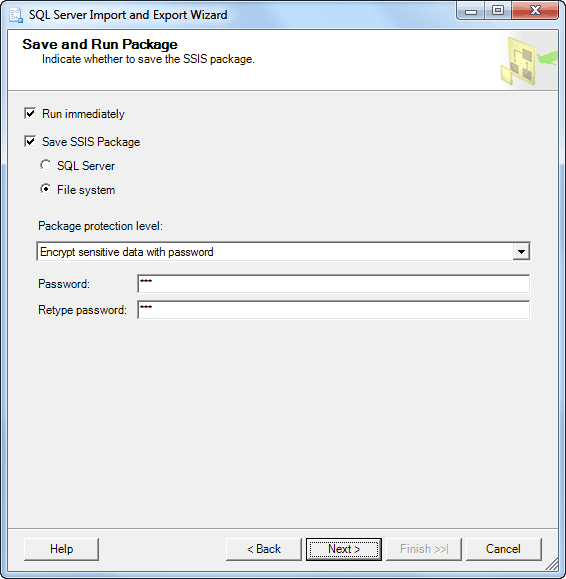 where the package password is from the "SaveandRunPackage" step of the Import-Export Wizard. 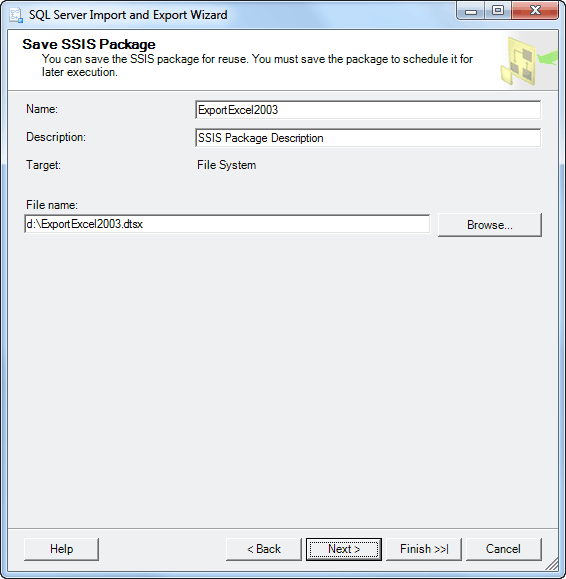 /set \Package.Connections[SourceConnectionOLEDB].Properties[ConnectionString];\""Data Source=%server%;User ID=%username%;Password=%password%;Initial Catalog=%database%;Provider=SQLNCLI10;Auto Translate=false;\""
/set \Package.Connections[DestinationConnectionExcel].Properties[ConnectionString];\""Provider=Microsoft.Jet.OLEDB.4.0;Data Source=%file%;Extended Properties="Excel 8.0;HDR=YES";\""
/set \Package.Connections[DestinationConnectionOLEDB].Properties[ConnectionString];\""Provider=Microsoft.ACE.OLEDB.12.0;Data Source=%file%;Extended Properties="Excel 12.0"\""
Pay attention that "Excel=12.0" is used as Extended Properties. Otherwise, you will get en error. source=\Package.Connections[SourceConnectionOLEDB].Properties[ConnectionString];\""Data Source=ko7h266q17.database.windows.net;User ID=excel_user@ko7h266q17;Password=ExSQL_#02;Initial Catalog=AzureDemo50;Provider=SQLNCLI10;Auto Translate=false;\""
If Workbook_Template is specified the command file copies the template to a destination file before the package run. If the Workbook_Template column contains the delete value, the command file deletes the destination file before the package run. if .%type%.==.jet. 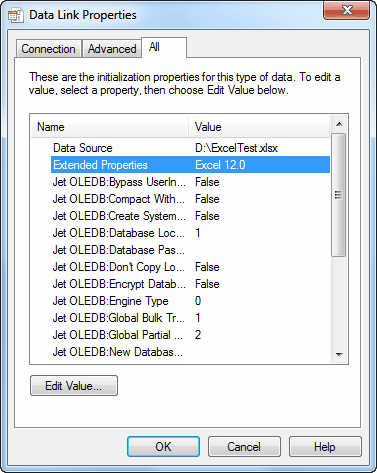 set destination=\Package.Connections[DestinationConnectionExcel].Properties[ConnectionString];\""Provider=Microsoft.Jet.OLEDB.4.0;Data Source=%file%;Extended Properties="Excel 8.0;HDR=YES";\""
if .%type%.==.ace. set destination=\Package.Connections[DestinationConnectionOLEDB].Properties[ConnectionString];\""Provider=Microsoft.ACE.OLEDB.12.0;Data Source=%file%;Extended Properties="Excel 12.0"\""
The download package includes all these batch and example files. If you have SQL Server Standard or higher, you can use SQL Server Integration Services to export SQL Server data to Microsoft Excel 2003-2016 or CSV files.